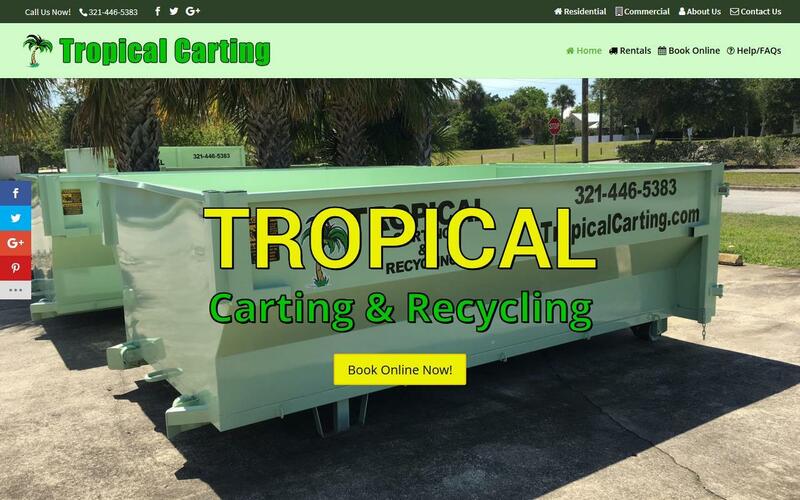 The Tropical Carting and Recycling web design project utilizes the WordPress content management system and premium theme, which includes lifetime updates. The theme used is currently #2 for a reason, it is very well designed, regularly updated and a versatile multi-purpose theme that allowed us to create an attractive and functional site for this client. James was a pleasure to work with for our web site. He’s a very knowledgeable web designer and a great person in general. Would highly recommend him to anyone in need of a web site. Our web site is very nice and he takes care of any issues the web site has within minutes of me calling him. The completed project uses the clients brand colors and logo, is very mobile-friendly and the entire site acts like a funnel to lead visitors to the booking feature. There are numerous links, call-to-action features and visuals to encourage potential clients to either book a dumpster directly on the site or contact them to discuss their needs.